Ferosal Plus - liquid iron food supplement enriched with royal jelly and vitamin C. For children over 4 and adults. 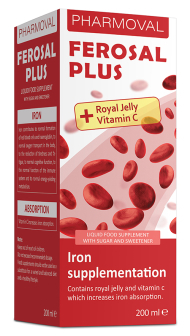 Iron contributes to normal formation of red blood cells and haemoglobin, to normal oxygen transport in the body, to the reduction of tiredness and fatigue, to normal cognitive function, to the normal function of the immune system and to normal energy-yielding metabolism. Vitamin C increases iron absorption, contributes to the normal function of the immune system and to the reduction of tiredness and fatigue. Children ages 4 to 7 - 5 ml daily. Children ages 7 to 12 - 10 ml daily. Children over 12 and adults – 15 ml daily. Consume listed amounts in a glass of water or juice. Use a measuring cup for accurate dosage. Before using this product consult medical proffesional. After taking product, your stool can be dark colored. There is the possibility of temporary coloration of teeth, which can be reduced by taking the solution with a glass of water or juice. Exceeding the recommended daily doses may lead to iron poisoning. In the case of unexpected reactions to the product, seek medical advice immediately.